Rose water for acne, hundreds of websites tell us, is the easiest way to get rid of acne and the scars it leaves behind. But is rose water really a workable treatment for acne? Rose water is good to use on dry skin, as it increases oil production and the growth of new skin. Rose water is an emulsion of rose oil in water created as a byproduct of distilling rose petals. Rose water stimulates the growth of the skin and increases oil production in the skin. It’s a remedy for dry skin rather than for oily skin. Rose water works better when it is combined with lemon juice. If your skin looks unusually shiny after using a combination of rose water and lemon juice, use more lemon juice and less rose water next time. Don’t use rose water if you have rosacea. Rose water is a useful addition to your tools for your fight against acne. For a complete acne treatment system, consider Exposed Skin Care. Rose water is a mixture of essential oils from rose petals suspended in water. It is a byproduct of distilling rose petals for their concentrated essential oils known as rose attar or rose otto. It takes about two metric tons of rose petals to make one kilo of rose attar, or one common ton of rose petals to make a pound of rose attar. Workers pick rose petals and deliver them to a processing shed so they can be crushed before distillation in a huge copper pot. In this still, the petals are covered with water and heated for about two hours. Then a valve is opened to allow steam to escape from the still to be collected in a cooling flask. The steam carries essential oils of rose and water to the flask. About 20% what arrives in the collection flask is essential oil, and about 80% is water with small amounts of essential oil mixed in. This water is known as rose water. The rose attar is a dark green syrup. As it cools, the green syrup forms white crystals. But the rose water stays liquid at room temperature and can be used in a variety of ways. Some of the favorite foods of Greece and Turkey are flavored with rose water. Loukoum, also known as Turkish delight, is flavored with rose water. In India and the Arab world, rice is flavored with rose water. Rose water is used as a substitute for cooking sherry, vermouth, and wine in the Muslim world, and it is an important ingredient in fruit drinks in Malaysia and Singapore, marzipan in Europe, a French dessert known as a madeleine, and in the cookies and candies popular in the early United States. Rose water contains a variety of natural bioactive chemicals. The scent and taste of rose petals are due to a chemical called phenylethyl alcohol. Depending on which kinds of roses are harvested, how fully the roses have opened when they are picked, and the length of the distillation process, rose water also contains varying amounts of cintronellol, geraniol, methyleugenol, linalool, and various kinds of complex sugars. It seems only reasonable that anything you call “water” would hydrate the skin, making it moister and more supple, helping clogged pores drain. When British scientists actually tested rose water on healthy skin, however, they found the opposite effect. Rose water did hydrate the skin, but pores got tighter, and sebum production increased. The British experiment was the final word on rose water as an acne treatment for 36 years. Then scientists at the Freiburg University Medical Center in Germany took another look at how how rose oil interacts with the skin. What the scientists discovered was that the rose oil component of rose water stimulated the activity of skin cells known as keratinocytes. These cells lie in the basal layer of the skin. They produce new skin cells that gradually migrate up to the outermost layer of the skin, protecting it from injury and infection. They can also do the cellular equivalent of somersaults to move to different locations in the skin when they are needed to heal a wound. But that isn’t all that keratinocytes can do. If the immune system detects infection on the skin, the keratinocytes can also release inflammatory chemicals that attack both germs and healthy skin cells. They can also release anti-inflammatory chemicals that “put the brakes” on inflammation in the skin. 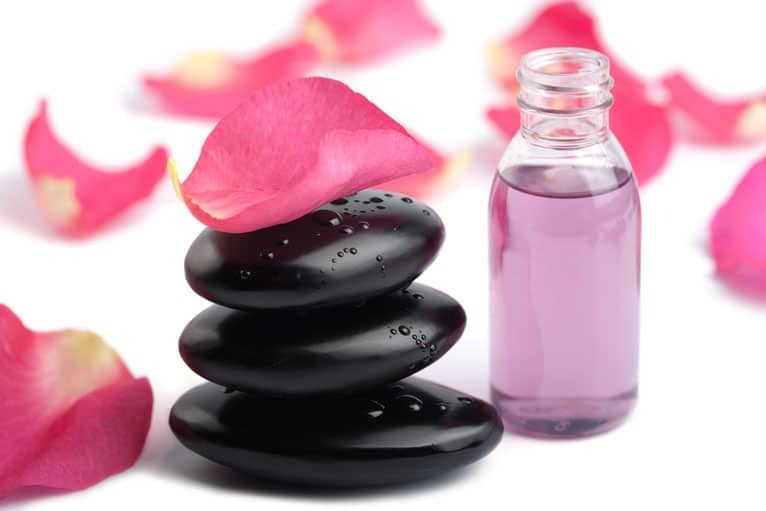 Because keratinocytes have so many different functions that are stimulated by contact with rose water, it is not surprising that different people have different experiences when they use rose water to treat acne. Some people report that their blemishes heal in days, and some report that using rose water makes clear skin red. Rose water can be mildly irritating if it is used the wrong way, but it can be strongly healing if it is used the right way. The best way to use rose water for acne is to use as a wash for pimples on dry skin. Using rose water and lemon juice together is even better. Don’t use rose water if you have rosacea. Any kind of essential oil can aggravate rosacea, and treating your pores and the surface level of your skin really does not resolve rosacea. Pour out 15 ml (1 tablespoon) of rose water into a clean bowl. Add the juice squeezed from one lemon. This will probably be about 30 ml (2 tablespoons). Set the bowl aside in a convenient place while you cleanse your skin. You will need a clean soft washcloth and a clean towel for what comes next. Wash your face with your usual cleanser. Rinse off the cleanser with warm water and pat your face dry with a clean towel. Then place the clean soft washcloth into the mixture of rose water and lemon juice until it is soaked, close your eyes, and place the rose water-soaked wash cloth over your face. Moisten your skin with the mixture and allow to dry. Wait 15 minutes, and then rinse the residue off your skin with warm water and pat dry again. The rose water in this combination stimulates the growth of skin around pimples and helps them open naturally and heal. The lemon juice removes dead cells off the surface of the skin and also helps pores open. Stimulating the growth of skin should bring out natural skin tones in greater color and depth. The surface of your skin should be more matte and smooth. If you notice your skin looking shinier than normal after using the combination, then use half as much rose water next time. Rose water can be a useful treatment for dry acne-prone skin that is not subject to rosacea. For the a comprehensive acne care program, try Exposed Skin Care.